Humans first emerged 200,000 years ago but didn’t figure out how to use language until 100,000 years ago, scholars think. Now, an intriguing new study suggests that cave drawings had an important role to play in the evolution of language by familiarizing our ancestors with symbolism. 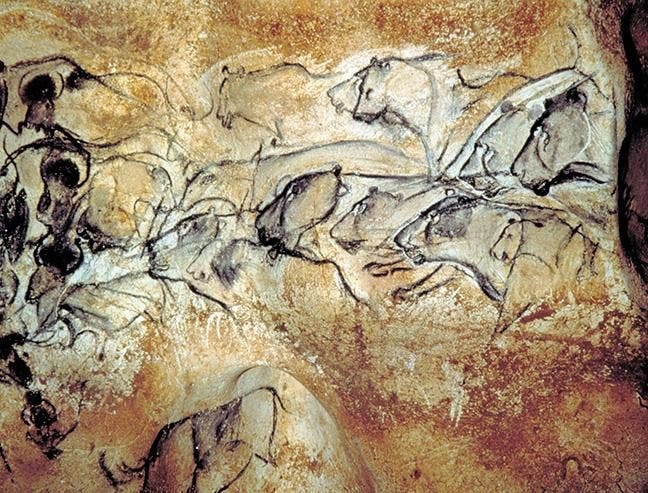 The Chauvet Cave paintings, dated at 30,000 to 28,000 BC, were once thought to be the oldest cave drawings. Here, we can find more than 1,000 paintings depicting lions or mammoths of unmatched sophistication. Credit: DRAC Rhone-Alpes, French Ministry of Culture. Our species has had a knack for art from its humble beginnings. To this day, you can still find ancient cave art on virtually every continent except Antarctica. In some places, like South Africa, there are over a million drawings made inside caves. Drawing such as those found on the Indonesian island of Sulawesi, where there are 35,400-year-old depictions of a babirusa, or pig-deer, once common in these valleys. The spectacular lions and rhinos of Chauvet Cave, in southeastern France, are commonly thought to be around 30,000 to 32,000 years old, and mammoth-ivory figurines found in Germany correspond to roughly the same time. Writing in the journal Frontiers in Psychology, researchers from MIT argue that places Chauvet or Sulawesi acted like hotspots for language generation by offering the perfect environment to translate acoustics into drawings. “Our research suggests that the cognitive mechanisms necessary for the development of cave and rock art are likely to be analogous to those employed in the expression of the symbolic thinking required for language,” says Cora Lesure, a linguist at MIT and one of the study’s authors. Lesure and colleagues that the brain uses the same cognitive functions to transfer acoustic sounds to pictures as language. Linguists often frustratedly say that language doesn’t fossilize but it can leave artifacts — cave drawings, for instance. And in this context, our early ancestors used cave drawings less as means of artistic expression, as Picasso or van Gogh would, but rather more as a means of communication. At this point, this is still speculative work but what Miyagawa or Lesure are doing is starting a discussion with potentially huge ramification. The MIT linguists hope to inspire more work and further scrutiny of the syntax etched on the walls of ancient caves around the world. Hidden in these drawings are stories that reveal content that might one day lead us to the origins of language. In this respect, the holy grail would be finding cave art older than 100,000 years.